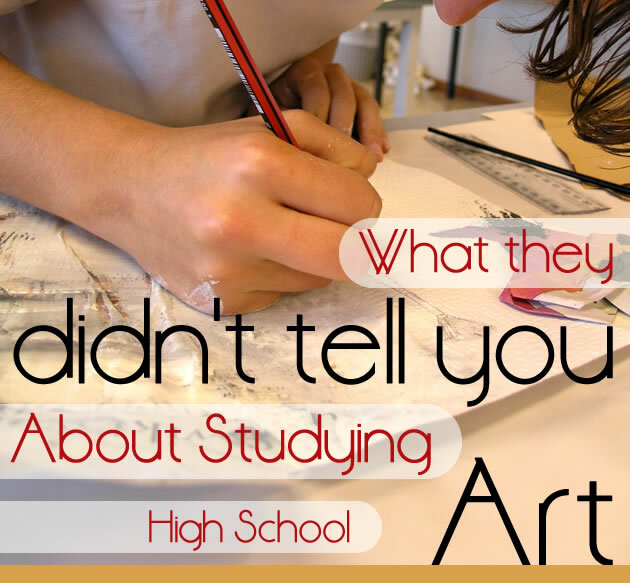 This article aims to provide a clear, unbiased view of what studying a Art at high school is like. It complements our Art Careers resources and aims to help you decide whether a high school Visual Art or Design course is right for you. It is written by recent UK high school graduate, Megan Fatharly, who attended Hitchin Girls’ School, Hertfordshire, England, and contains quotes from many high school Art students around the world. When I first started studying GCSE Art (a UK Art qualification for 14-16 year olds) it felt daunting, because I was so certain that to be considered ‘good’ I had to draw perfectly, however I soon learnt to develop my own style and enjoy the freedom that the subject allows. You are able to explore a chosen subject matter and experiment with materials to express ideas, whether that be through painting, sculpture or through any other medium. Art is often described as a ‘mickey mouse’ subject or ‘soft option’ by people who have little understanding of the subject. Art has a large practical component; there is the view that it is not intellectually demanding or academic. People may not realise the higher ordering thinking that is required when studying Art to evaluate, analyse and develop artwork and themes and at times produce comprehensive written projects in some areas of study. The subject may be discredited by the media, career advisors and fellow students. In my own experience though, I find people usually appreciate the amount of effort that is required and admire your dedication to the subject, especially when you study Art at a senior level, where there are often written components such as a Personal Investigation / Personal Study or formal art analysis. I have had friends who studied ‘academic’ subjects like Maths or Science as well as Art. I think people forget that these subjects can complement each other. This is very beneficial if you want to study something like Architecture, for example. In Art, you are also challenging yourself creatively, whereas in more academic subjects it is more about facts, understanding and objectivity. With a subject like Art you are expressing yourself in a different way. If you are serious about pursuing Art, you need to get past what other people think of the subject. You are the one who will be studying it, if you find joy in doing it, it may be the right choice for you (read 9 reasons to study Art in high school). Some students are shocked to learn that you can’t just ‘draw whatever you want’. A very important part of most high school Art qualifications is drawing and observing. This means that it is important to draw things from life rather than photographs when possible. You can look at different angles and truly observe the object (read how to create an excellent observational drawing). If you are deciding whether to pick a creative subject at a higher level, it is important to realise that Art does not involve a list of facts or content to learn like other subjects. Mark schemes can involve imprecise and vague terminology. Because of this, you may be unclear about what is expected or needed to excel. This is why I think it is important to look at examples of student work before selecting the subject and at exam board websites, as they often try to explain what is expected. Reading the official syllabus can be a great place to start. This will give guidance in terms of quantity of work required, deadlines and how things should be submitted. It is important to understand key terminology, such as ‘development’. This is how to go from one part of your project to the other to show how your work is progressing and does not appear disjointed. There are some great articles on this website which I used throughout studying Art which show what these words mean. When viewing artwork on this website, remember that the Student Art Guide features the best work from students around the world. I think it is really important to not feel daunted by this (I know I did) but remember that you will have time to improve and refine your skills over the time you study a creative subject like Art. The most important thing you can do if you are unsure about what to expect, is talk to your Art teacher. You will get an idea of the workload and the syllabus structure that your school or college follows. They can show you examples of current or past student projects, so you get an idea of the kind of work that people create. Also, talking to older students, although a daunting prospect, is highly beneficial, as they can tell you personally how they feel about it and answer any questions. There is often a misconception that everyone who takes Art at a senior level in high school must have a supreme level of ‘talent’. The presence of high achievers can be more obvious than in other subjects, where it is not always clear who is the best student. In Art, your achievement is laid out on the table for everyone to see. This can be nerve-racking…but also inspiring. This is exactly how I felt at GCSE level. At this stage I was never 100% confident with my drawing. As a main component of any Art qualification, this was something I had to overcome. I was surrounded by people who I felt were ten times better than me. However, I think it is important to consider what you enjoy doing. Drawing does not automatically mean hours and hours spent on a stunning pencil drawing. I found that drawing in pen worked for me, as it allowed a looser style of drawing. There are many types of mark-making, and even if you don’t excel with one technique, you can build upon strengths in another. I was still observing, just in a more expressive way. I found other ways of recording ideas; this included photography. It was when doing GCSE Art that my passion for photography developed. During A Level (a qualification typically taken by 16-18 year olds) I developed a love of working in pen, experimenting with different types of mark making. There will be others who feel like you do about a particular medium. There are often students who feel that they are great drawers but weaker painters. Over time, skill with wet mediums often improves dramatically and students learn to work faster. Working in a new medium means you can use it in a way that you enjoy. At the end of the day, all students have strengths and weaknesses. Some are above-average or average at the subject, but enjoy it. As with any subject, there are those who excel in all areas too. In most classes there are a range of abilities and it is important to consider this, if you feel you’re not as good as everyone else. You will develop throughout the course and refine your skills and find a medium you enjoy to work with. No matter where your ability level begins, you can make tremendous progress in a year. Because of this, my confidence in the subject grew and I came to trust my creative decisions more. Remember also that you don’t have to have the best skill level in your class to excel and that having the right attitude is just as important. If you are motivated and put the effort in you are likely to enjoy the subject more. If your attitude and effort are positive this will have a greater influence on your mark (read what makes an Art student excel and why some students never get high grades). Some people truly underestimate the workload, but with the right attitude, the workload should not scare people off. With a subject like Art, the work is continuous. Your ideas evolve with the project and so does the type of work you do. It’s not so much that the workload is unmanageably enormous, but that it is continuous, and you can’t get away with working hard just before an exam. At A Level, I had five hours of Art a week and was told for every hour in school we should spent an hour out of school. However, it really is down to how much effort you are prepared to put in. Five hours of work may be a beautiful pencil drawing but it might also be several expressive paintings. It is also important to consider that it should be quality over quantity (although obviously you need sufficient quantity to meet the assessment objectives, and that this doesn’t mean that a disorganised student can expect to submit only a handful of pieces and still get a great grade). This is something I learnt from GCSE. Quality of the work is much more important than how much you do, as you may spend time on something that does not show any development or experimentation. The submission of weaker pieces can bring your grade down overall, so it is far better to aim for a manageable quantity and execute it well, than to produce masses of lower quality work. Time management is important. If you can keep on top of a project the workload seems less overwhelming. Again, there are great resources on this website to help, such as how to stop procrastinating and get your Art homework done. Art is different to other subjects in the terms of equipment and materials. You are typically lugging around sketchbooks (something you’ll get used to) other art supplies and various still life items. It is important to consider the cost of these materials if you are contemplating taking Art. Subjects like Photography and Graphic Design, in particular, require you to print a lot, in addition to initial stationery and camera costs. In younger years at school, Art classes are often very directed. However, by the time you get to senior high school, students are usually required to be more independent and think for themselves. I really enjoyed being more independent when I did A Level Art, because you learn to think for yourself and trust your creative decisions. Being surrounded by other creative people who enjoy Art as a subject can be very motivating. It gives you a chance to talk about your work and see how other people develop and interpret a theme or project. For me, the atmosphere of the classroom for other subjects was different. I always felt very relaxed when I did Art, as it was different to my other subjects that were heavily textbook or essay based. In some Art classes you may even be able to listen to music while you work and there are always great discussions going on. You will quickly become comfortable talking about your work to others. This might mean presenting your work to others and sharing your process from the start to the end of a project. My teachers at my school did exercises like this and I found is hugely beneficial as a confidence booster. It also gave me the chance to gain feedback from others, which as an artist you may not always agree with, but constructive criticism never hurts. You can learn a lot by listening to other talking about their process. If you are considering taking Art, having completed A Level Art I can say it is one of the best choices I ever made. I have grown so much as a person and my confidence with working in different mediums has improved. You challenge yourself if you choose it, because you have to think independently, creatively and methodically about how you will develop a project. I thoroughly recommend taking it because the possibilities of what you can do are endless. Megan’s work can be viewed on Facebook or Instagram. This article was written by Megan Fatharly, who graduated from high school in 2014. Megan gained an A* in GCSE Art and Design, an A for AS Art and Design and an A Grade for A Level Art, under the OCR UK examination board. She is currently completing a UAL Foundation Diploma in Art and Design at Falmouth University and will start a Bachelor of Arts in September.